The Vallejo Ferry provides year-round ferry service between Mare Island, Vallejo and San Francisco Ferry Building or Pier 41 terminals. Where is the Vallejo Ferry? 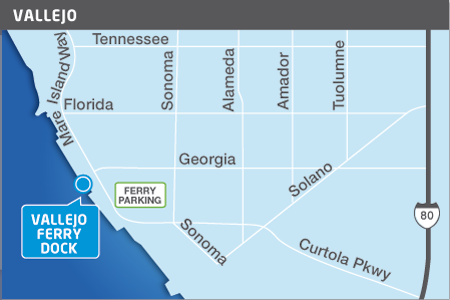 The Vallejo Ferry terminal is located at 289 Mare Island Way Vallejo, CA 94590. How much does the Vallejo Ferry cost? Where can you buy Vallejo Ferry tickets? Vallejo Ferry tickets may be purchased at the Vallejo Ferry ticket office Monday through Friday, between the hours of 6:45 AM and 5:00 PM, and Saturday and Sunday, between the hours of 9:00 AM and 5:00 PM. For customers who require a monthly pass, the Vallejo Ferry ticket office will open at 5:00 AM on the first and last two weekdays of the month, excluding holidays. If ferry ticket offices are closed, full-fare, one-way tickets may be purchased onboard – cash and credit cards accepted. If you have any questions, the Vallejo Ferry terminal can be reached at (877) 643-3779. How long is the ferry ride from Vallejo to the Ferry Building? The ferry ride from Vallejo to the San Francisco Ferry Building takes 60 minutes.